Yeah, we're lost. I think we should have turned left at Vienna. It’s hard to get good swords and sorcery in the movies, but every once in a while they do it right. This is that once in a while. 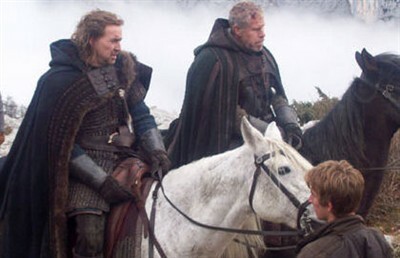 This is the tale of two disillusioned Crusader knights who get pressed into service by a Church they no longer believe in to transport a girl accused of witchcraft to an isolated monastary high in the Carpathian mountains. You have to admit that touring through Hungary on horseback beats rotting in a church oubliette. Well, actually, that’s not the real story. The real story is that of an altar-boy who wants to be a knight, and sees his chance to earn his spurs by accompanying and helping the knights on their mssion. It is a little known fact that any knight can make anyone else into a knight. It doesn’t have to be some lord. Considering that it is the altar boy who actually performs the mission and lives to see the end of it, then actually he is the hero, and it is his story. But, wait, that’s not the real story either. This is the story of an innocent young woman who is accused of witchcraft. She is beaten and tortured by the medieval church, then thrown into an iron cage and hauled for hundreds of miles across a plague-stricken landscape to undergo final judgment and purification at a remote mountain monastary. I didn't know what would happen to me when I asked for the economy fare. No! Hold on! That isn’t the real story either. This is the tale of a being from another world. It is trapped on Earth, a planet hostile to its very existence. Fanatical churchmen are on a mission to destroy this being, so it fights for its life, and finally it gets the chance to defeat the enemy by destroying a rare book–then these crazy Crusader Knights get in its way. Not the demon in the film, but you get the idea--ugly, nasty, evil, tough. I guess the story depends on your point of view. In any case, I like it. 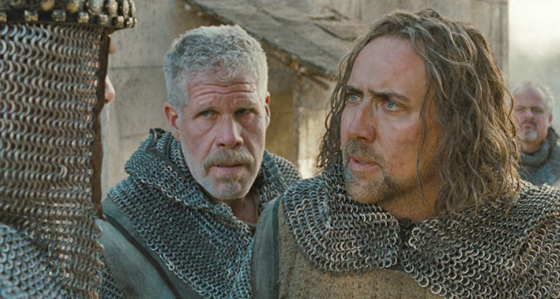 Nick Cage and Ron Perlman were incredible as disillusioned Crusaders on the run from a dominant church. The plague-stricken countryside was truly horrifying. The scenery was magnificent. The acting by all involved was very good. The special effects were great. With all these things going for it, you’d think the movie would be a big hit. But, it won’t be. It will be lucky to make a profit. 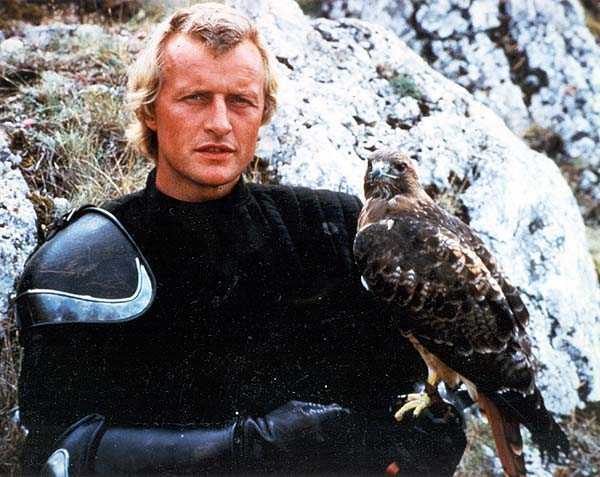 Give it a couple of years and it may become a cult classic like Ladyhawk. Living under a curse is for the birds! 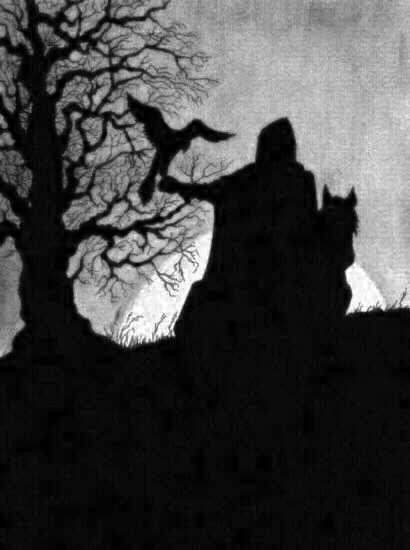 Those of us who love dark fantasy will appreciate it. Most people, and most people aren’t my readers, wouldn’t recognize dark fantasy if it bit them, won’t go to see it. They won’t think about it, and they won’t remember it. But, if you play any form of Dungeons & Dragons. If you play Tunnels & Trolls, or The Fantasy Trip, or Runequest or any fantasy rpg, then you should see this movie. It is great for helping you really visualize and describe those castles and crypts that are in your own games. It is also a pick them off one by one movie. Who will die next, and how? As Game Masters, isn’t that what we love to do with our players? Atroll says the Season of the Witch is a masterpiece. This review is late, but see it if you possibly can. 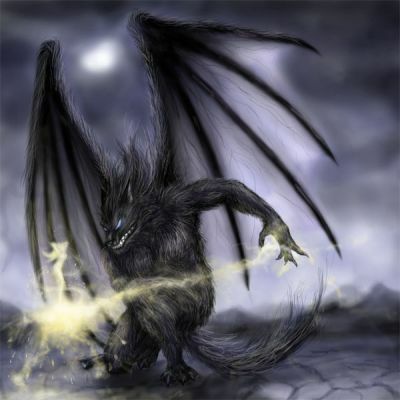 I have no reason to put this picture down here, but it captures the essence of dark fantasy and I like it. Does this tower look phallic to you? Disney artists always do that. There are so many fine fantasy movies that come out during the Christmas holiday season that I can’t keep up with them. This review is about a month late, but I’ve been having a hard time finding time to blog lately. Now that I will be cooling my heels for 2 hours a day in the Phoenix College Library, I should have time to sound off on the movies I’ve seen, the books I’ve read, etc. But I did get to go see Tangled with the family on Sunday, December 12. Here comes my review. 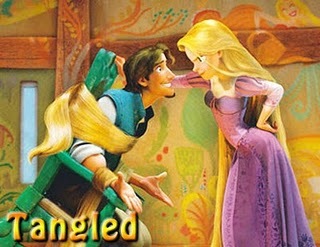 I read somewhere that Disney says Tangled is the last fairytale cartoon they will be making for a long time to come. Little girls don’t identify with princesses any more. I believe it. Judging from what I’ve seen in the library (where I worked last year) little girls now identify with sluts. What they’re watching is sleazy dance videos of hot girls in hot pants shaking their THANGs. Hey! If I were a ten year old boy, I’d be all in favor of this trend. Gonna be lotsa good cheap stuff waiting for those kids in 6 to 10 years. Back to Tangled. It’s an update of the Rapunzel story–the princess imprisoned in a tower where the only means of ingress is a high window and she has to let down her hair for her captor to climb up. Never mind that hair would never grow that long, or that the human scalp can’t take that much weight. It’s magic, and wonderful things can be done with the proper fulcrums. The hero of the story is a pretty-boy thief who is so stuck on himself that it’s a wonder he could ever pull himself away from any mirror he might see. 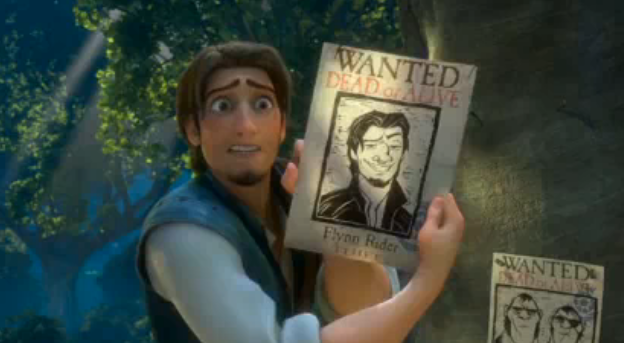 He collects the WANTED posters bearing his image and complains that the artists never get his nose right. He reminds me a lot of Aladdin, although it turns out his real name is Eugene. Ha! Now I identify with him. My middle name is Eugene. They just can't get the nose right! There is also a Wonder Horse and a smart-aleck chameleon. Cute animals are a Disney trademark. In fact, I don’t think there’s a single Disney trademark overlooked in this movie. Cute animals, singing princesses, evil female sorceress driven by her need to be beautiful, acrobatic thief who’s really a good guy in need of redemption, thugs with unexpected talents and aspirations–have you ever noticed how the thugs in Disney cartoons all have their own endearing character traits and talents? 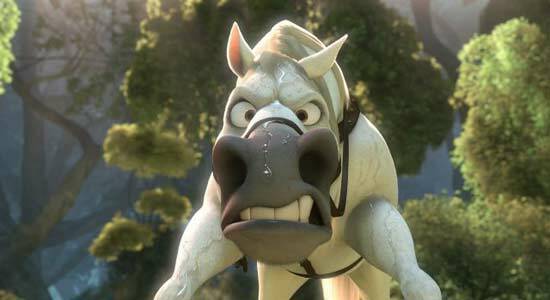 The real star of the show is Fred the Wonder Horse--smarter, better-looking, more athletic, and with better morals than any of the humans. 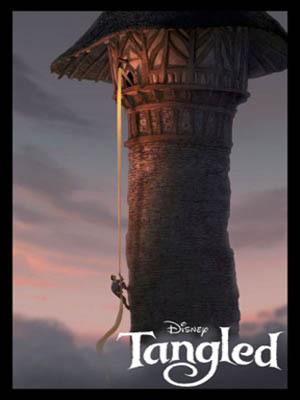 Beautifully animated, perfectly predicatable, about as deep as the surface of a mirror, I still liked Tangled. It is classic Disney Fairy Tale stuff, and if it’s the last they do, it will be a good way to end. See this movie with a kid. This is the kind of thing little girls should be watching. There are also some unexpected subtleties to keep the adult audience amused–see that first picture and my comment. Pure cinematic sugar! Lovable thief in a hairy situation. This is the easiest blog I’ve done all year. Stat monkeys at WordPress did all the work. Still, I wonder how accurate it is. Seems to me I did better in December with John Wick’s party than with GenCon. In 2010, there were 80 new posts, growing the total archive of this blog to 116 posts. There were 623 pictures uploaded, taking up a total of 89mb. That’s about 2 pictures per day. The busiest day of the year was October 16th with 251 views. 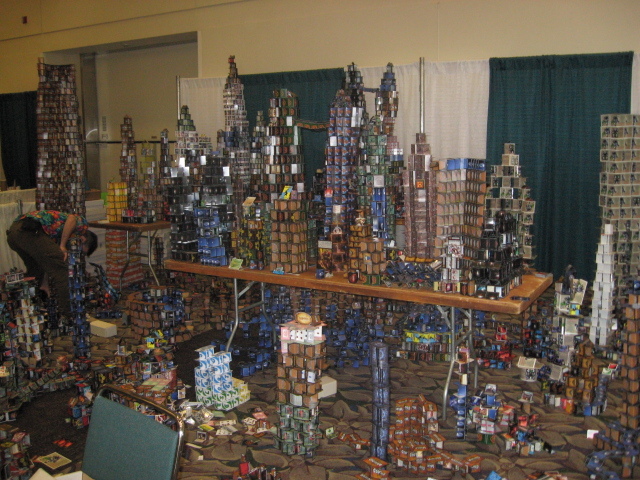 The most popular post that day was GenCon 2010–People I Met. Some visitors came searching, mostly for green lantern, skaar, jabberwocky alice in wonderland 2010, trireme, and hulk. I know I got more comments than that on some of these blogs.